The All-Star festivities have officially come and gone in Kansas City. 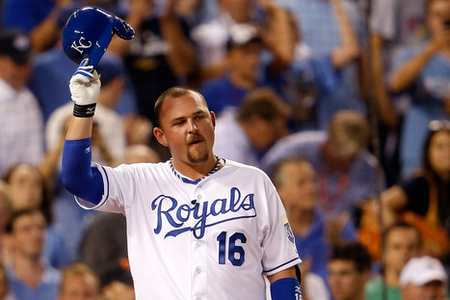 Billy Butler doffs his hemlet before his first at-bat in the 7th inning to a roaring crowd. FanFest was an overwhelming success. Upon going up the escalator to the show room at Bartle Hall, when you see the banners hanging from the ceiling, authentic baseball memorabilia on walls and tables, Cal Ripken and Barry Larkin instructing a local high school baseball team on proper fielding techniques, everybody thinking and talking about baseball, and nearly 80% of the fans attending wearing Royals gear, you knew you were in baseball heaven. If you didn’t do anything else baseball related during All-Star week in Kansas City, I hope you at least took a few hours to venture downtown, take a stroll through Barney Allis Plaza on your way to FanFest. It was a living, breathing baseball museum with every ounce of baseball history covered from head-to-toe. And for $30 a ticket, you got way more than what you paid for. The All-Star Future’s Game drew a record crowd. 40,000+ attended the Future’s Game most likely due to the presence of future Royals Wil Myers, Jake Odorizzi, and Yordano Ventura. If that doesn’t make Dayton Moore call-up Myers and/or Odorizzi, I don’t know what will. It goes to show you though, if you put an exciting product on the field, the stadium will be filled almost every single night. This is a baseball town. We just haven’t had many teams to rally behind in the past 10+ years. The Homerun Derby… was everything a Royals fan could have ever wanted (outside of seeing Billy Butler send a few BP fastballs into the fountains). Oh, what a night it was. The Homerun Derby is, and always will be, an exciting affair. And this year’s was no exception. We all know the story. Robinson Cano, the captain for the American League’s half of the Derby, stated publicly that he would assuredly select a Royal to participate – which happened to Billy Butler. Then Robby snubbed him. Feeling like Robinson Cano slapped the entire KC community across the face, the outraged Royals fanbase (myself included) took their anger to the Twitterverse. And boy, did it work. Robinson Cano drew the biggest collective “boooooooooo” I have ever had the priviledge of hearing. I also have never heard a louder crowd collectively cheer for one person as they did when they called for Billy Butler. My wife and I, watching from home, couldn’t help but laugh, smile, and throw in a few cheers and “boos” of our own during Cano’s failed hacks. Watching him hit pop-up after pop-up into the outfield literally made my week. In all, Robinson was a glorious 0-fer – hitting absolutely zero homeruns. That itself made it all so, so sweet. Outside of Cano, the fans were treated to a great show by Mark Trumbo and Derby champ Prince Fielder. Trumbo, who Cano supposedly picked over Butler, hit possibly the most impressive homerun I have ever seen when he launched a ball onto the roof of the Royals Hall of Fame in left field – some 475+ ft. Equally impressive was the amount of balls Prince was able to send into the fountains deep in right center. The All-Star Game was a lopsided affair. Justin Verlander got rocked. How often have you ever been able to hear that? 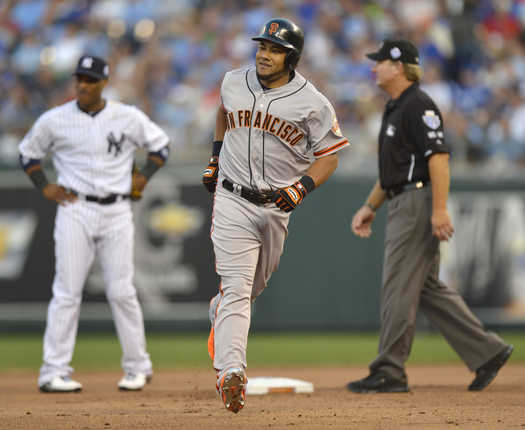 The NL was able to talley five runs off of him in the first inning thanks to a Pablo Sandoval bases-loaded triple (the first such occurance in All-Star Game history). But without a doubt, the most memorable moment of the game didn’t come when Bryce Harper lost a flyball in left field. Or when Derek Jeter and Ryan Braun chummed it up on the field in the midst of Braun’s triple. Or when Robinson Cano was booed yet again. Or even when Billy Butler finally got his first AB in the 7th inning (although that was a close 2nd). For me, it was when Chipper Jones took his first at-bat ever in Kansas City. Before Tuesday, the long-time veteran had played in every single stadium in the league except for Kauffman Stadium. He hit a choppy groundball between first and second that was “just” out of Ian Kinsler’s reach for a basehit. You could see Chipper smiling at Kinsler when he reached first base. Any other day, Kinsler makes that play. Both CF Lorenzo Cain and 2B Chris Getz have been activated from the DL and placed on the active roster. RHP Nate Adcock and INF/U Irving Falu were the roster casualities, as both were sent back down to Omaha. After having a solid showing at the Future’s Game, Wil Myers went 2-for-3 with a run scored and a RBI in the Triple-A All-Stars game as the PCL beat the International League 3-0. Wil was named the games’ MVP. Yordano Ventura, who started the Future’s Game for the World Team, was promoted from Single-A Kane County to Double-A Northwest Arkansas. 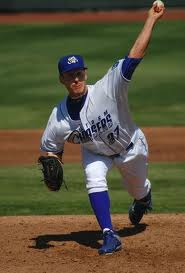 Joining Ventura in Double-A is lefty Mike Montgomery. In his second season at Omaha, Monty seems to have regressed significantly. In 17 starts (91.2 IP), he’s 3-6 with a 5.69 ERA with just 67 K to 43 BB and a 1.67 WHIP. Taking Montgomery’s spot in Omaha’s rotation will be another promising young lefty: Chris Dwyer. Through 16 starts and 85.2 IP this season for the Naturals, the 24-year old hasn’t faired much better than Montgomery. He was 5-8 with a 5.25 ERA, 71 K to 44 BB, and had a WHIP of 1.43. Dwyer’s promotion may have more to do with the Rule 5 Draft this offseason more than anything. In order to protect Dwyer from of the Rule 5 Draft, the Royals will have to place him on the 40-man roster sometime between now and the draft. If the Royals opt not to do so, they risk losing him to any team that decides he’s worth a spot on their 25-man roster for all of 2013. Note: In 2011, Baseball America ranked Dwyer as the 83rd best prospect in the game. Overall, Kansas City showed Major League Baseball and its fans a great time and was a more than gracious host to thousands of visitors. Here’s top hoping it doesn’t take another 39 years to have another one of these. The Royals parted ways with their longest tenured player on Wednesday afternoon when the designated Mitch Maier for assignment, thus clearing another spot on the 40-man roster – which now stands at 38 players. Mitch has been a model citizen ever since he became a Royal. He was selected as a catcher in the 1st round of the 2003 draft by KC before the organization opted to convert him to a third basemen in 2004. 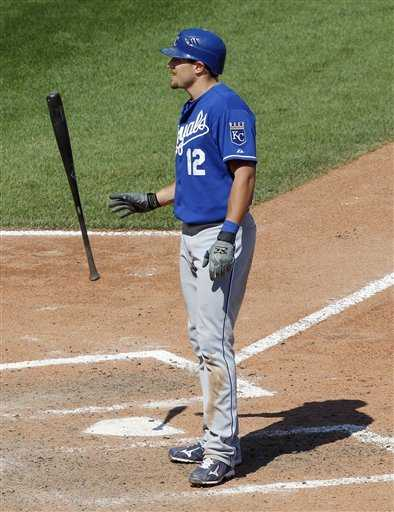 After the Royals acquired third basemen Mark Teahen as a part of the Carlos Beltran deal in 2005, effectively blocking his path to the majors, Maier was then shifted to the outfield. Nobody ever heard a single gripe or complaint from Mitch – that’s just who he was. He made his debut for the Royals in 2006 and spent all of 2007 and part of 2008 in Omaha before seeing major playing time in Kansas City. In parts of 6 seasons (360 games total) with the Royals, Mitch has amassed a slash line of .248/.327/.344 while filling in for the injured David DeJesus, Rick Ankiel, Jose Guillen, Coco Crisp, Scott Podsednik, etc. His best season came in 2010, when he played in 117 games, hit .263/.333/.375 with 26 XBH (15 doubles, 6 tiples, 5 HRs) while driving in 39 runs and scoring 41. 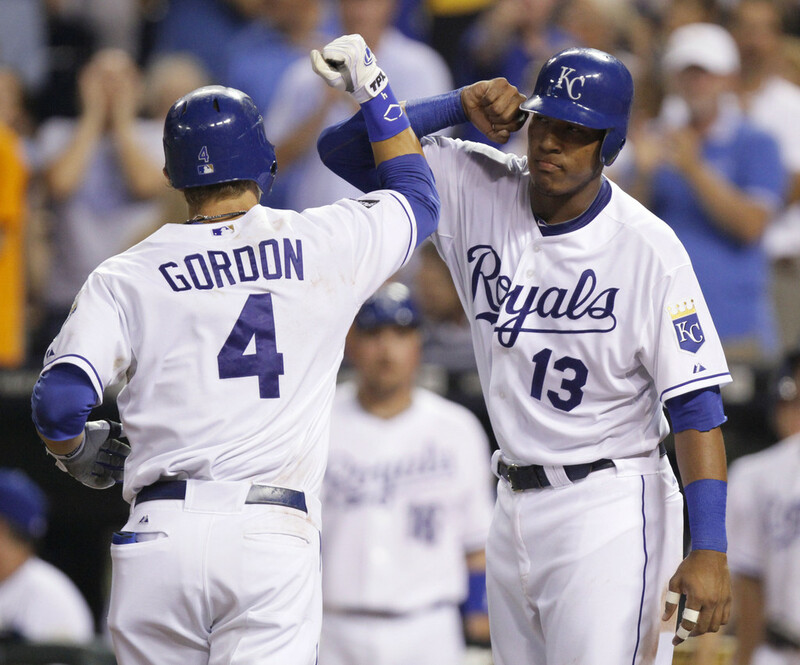 2011’s outfield of Gordon, Melky, and Frenchy limited Mitch’s playing time to just 45 games. But he did manage to make his pitching debut in Fenway Park that season, pitching one scoreless inning in a lop-sided loss. He followed up his first outing with an identical performace this season in another lop-sided loss, this time against the Indians. Bottom line: Mitch does his job. With Gordon and Francoeur playing practically everyday, Jarrod Dyson and Jason Bourgeois currently platooning center, Lorenzo Cain coming back from various injuries, and Wil Myers due to be in Kansas City any day now, Mitch is basically the odd man out. At 30 years old, he’s hardly a young player hwo just needs a shot somewhere. He is what he is: a utility outfielder who does everything fundamentally well, but doesn’t excel at any one area of his game. But guys like that are just as valuable to a team as any other position player. Every team needs a role-player who can come off the bench at anytime and be ready. I have no doubt that a team, most likely an NL club, will take a chance on him. Now let’s talk about the 40-man roster spot that has been vacated. Wil Myers and Jake Odorizzi. 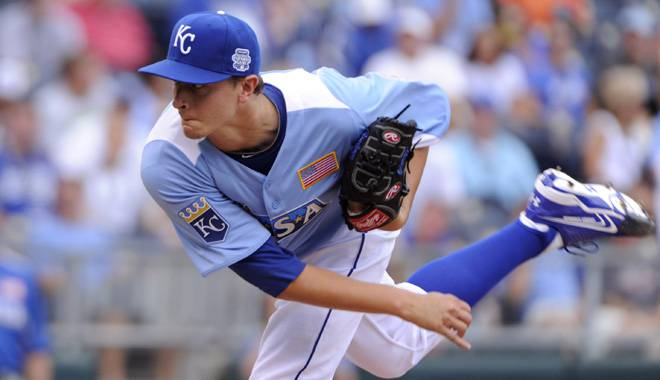 The Royals recently promoted pitchers Nate Adcock and Louis Coleman to Kansas City while optioning Vin Mazzaro back to Omaha. Both Adcock and Coleman are here to supplement the bullpen until after the All-Star break, with Adcock serving as a long reliever/spot-starter and Coleman as a 6th/7th inning arm. With both of them on board, the Royals are carrying 13 pitchers to 12 fielders (the normal split is 13 fielders and 12 pitchers). After the break, one of Adcock and Coleman figures to be summoned back to Omaha along with one of Jason Bourgeois and Irving Falu – with both Lorenzo Cain and Chris Getz slated to come off the DL soon. But with these two free spots on the roster, it’s hard not to think Wil Myers and either Jake Odorizzi are destined for Kauffman Stadium sooner rather than later. Wil Myers has done everything to earn his roster spot but drive to Kansas City and knock on Dayton Moore’s office door himself. Since being called-up to Triple-A Omaha, Wil has absolutely… well, you all already know: .317/.398/.639, 26 XBH (8 doubles, 4 triples, 14 HRs), 42 RBI, 40 runs scored, and has shown increased presence at the plate with his 1.75:1 K:BB ratio in just 47 games. He’s playing virtually every day in center field, which is probably the position with the biggest offensive void in Kansas City. Team officials have recently begun to acknowledge that it’s becoming increasingly hard to keep Myers in Omaha. So maybe when he makes the trip to Kansas City for the All-Star Future’s Game, Dayton Moore will give him a reason to stay beyond the break. Hardly to be outshined and over-shadowed, Jake Odorizzi is making his case for a big league promotion as well. Since his promotion to Omaha, he’s been flat-out dominant: 5-0, 2.83 ERA, 3:1 K:BB ratio, and a 1.42 WHIP. The starting rotation has been the Royals Achille’s Heel this season, as they’re only getting fairly consistent production from Bruce Chen. Hochevar has been both dominant and ineffective, Jonathan Sanchez deserves to be cut and never spoken of again, Duffy and Paulino are TJ victims, Vin Mazzaro has been below-average, Luis Mendoza should only start in emergencies, Nate Adcock has proven to be a better bullpen arm, and Everett Teaford has been good enough to get by. Clearly, this Odorizzi guy deserves to get his shot. Afterall, every one else seems to be getting second, third, fourth, fifth, and sixth chances. Although I’m extremely excited for all of the All-Star events being in Kansas City for the next week or so, I can’t wait until a week from now when the Royals lineup cards might include the names “Myers” and “Odorizzi”. On July 8th, three Royals prospects will be on national display in Kansas City as they take part in the All-Star Futures Game: outfielder Wil Myers and right-handers Jake Odorizzi and Yordano Ventura. Myers and Odorizzi will be part of the US team while Ventura, who hails from the Domincan Republic, will participate as a member of the World team. Wil Myers, at 21 years old, will be taking part in his second Futures Game. Highly regarded within the Royals organization, as well as around the league, Myers is doing all he can in Triple-A Omaha to force Dayton Moore to call him up to Kansas City. In 68 combined games between Double-A and Triple-A, Wil has a .336 batting average while recording 45 extra-base hits (24 homeruns, 18 doubles, 3 triples), 62 runs batted in, and 59 runs scored.Jake Odorizzi, 22, will be taking part in his first Futures Game. Like Myers, Odorizzi too is on the verge of being able to make an impact at the big league level. In 13 combined outings (12 starts) for Double-A and Triple-A, Izzy is sporting a killer 8-2 record with a 2.89 ERA in 72 IP. His K:BB ratio is nearly 4:1 (81 K:21 BB) and opposing hitters own a .219 batting average against him. Yordano Ventura, 21, will be partaking in his first Futures Game experience as well. Despite his size, the 5’11”, 140-150 lbs. starter has the ability to touch 100 mph. In 13 starts and 61 IP, Ventura has struck out 78 hitters while walking only 24. On the year for Class-A Wilmington, he’s 3-5 with a 3.10 ERA with an opposing batting avergae of just .227. Another member of the Royals will be taking part in the game, although this one is on the opposite end of the prospect-veteran scale. George Brett has been named the manager of the US team for the Futures Game. Triple-A Omaha manager Mike Jirschele and former Royal John Wathan will be a part of Brett’s coaching staff for the game. The All-Star Futures Game will take place at 4:00 pm on Sunday July 8th at Kauffman Stadium.